We’re recording late this week as Asher had a run in with his surfboard last week and hasn’t been able to talk properly for a few days. Get well soon Ash. Oli brought up the new wave park called “NLand” that’s opening in Austin, Texas sometime next year, and we also mentioned Surf Snowdonia in Wales who should be open in just a few weeks. Harry mentioned the ISA World Games that took place last month in Popoyo, Nicaragua. Costa Rica took the overall title as well as several other medals. Oli then mentioned the Surfers Against Sewage study in the UK where they plan to take Rectal Swabs to test for bacteria. Good luck to all the participants! That then lead us to talk about Surfrider Foundation‘s law suit with Huntington Beach over plastic bags. Harry suggested listening to the Skeptoid podcast episode on plastic bags for more information on the subject. We then moved on to talk about the WSL contest in Fiji which finished earlier in the week. Sally Fitzgibbons won the women’s contest very convincingly, while Owen Wright won the men’s with a pair of perfect heats. In the Surf Simply Podcast Fantersy League, Asher is leading the men’s tour and Coryn has taken the lead in the women’s. The next World Tour events are the Men’s J-Bay Open on July 08 – 19, and for the Women it’s the US Open on July 27 – Aug 02, 2015. We did also mention this silly advert by Braun, which I rather enjoyed. Harry spoke about the different materials that are used to build surfboards, and some of the techniques used to combine them. He got a lot of useful information from The Surfboard Book by Sean McCagh. For those of you who want to get really geeky, here are some more details on the actual materials we mentioned Fibreglass, Carbon Fibre, PVC, Polyurethane (PU) , Polystyrene Expanded (EPS) or Extruded (XPS), Polyester Resin, Epoxy Resin. In Talking about the Stringer Harry mentioned the Parabolic designs used by FutureFlex and Firewire that you can see here, as well as the carbon strips on the bottom and deck of the 3rd board. When we spoke about the Core of the board, we spoke about different Foam Densities, and here is an example chart from one company. Asher gave a shout to his long suffering shaper Mike from Whisnant Surfboards. When we spoke about XPS Foam Harry brought up FCD Surfboards & XTR Foam. While talking about the Skin of the surfboard we started by talking about resins, and here is a really interesting Paper on Resins used in Fibreglass production. We mentioned all Carbon surfboards by Aviso Surfboards and wooden boards by Grain Surfboards & Otter Surfboards. We then moved onto talking about sandwich construction surfboards, starting with the Firewire Timbertek construction, and then moving onto the Surftech Tuflite surfboards. Asher took us through the life of Phil Edwards. 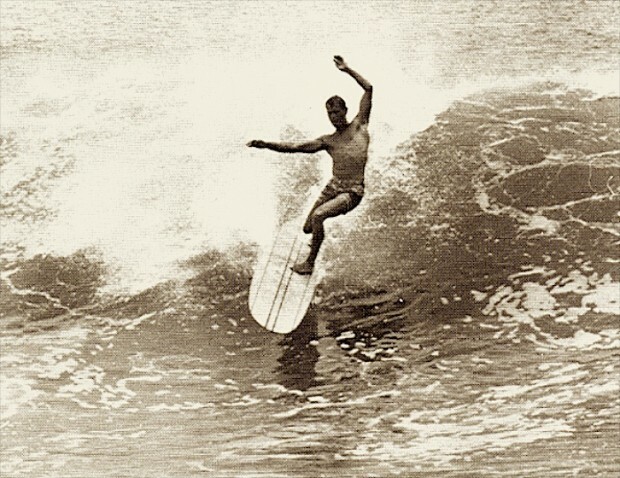 You can read more about him in the Encyclopedia of Surfing and on Legendary Surfers. I also found a copy of Surfing Hollow Days on YouTube, so hopefully they’ll keep that up. Noel LaPirre asked us about the downsides to riding too big a set of fins. We mentioned a few sets of fins in the talk the FCS AM2 and FCS ARC. First up this week is “Made in Austalia” which is Jay Davies’ new signeture movie from Red Bull. More importantly is GoPro’s Barrels of the Earth movie, which is amazing. Lastly is Surfer Magazine and Red’s collaboration ReDirect which you can check out, as they release new movies each week for the next few months. Unfortunately we can’t embed them on the site though.